Theresa's Mixed Nuts: Celebrate Halloween with JOLLY TIME! Celebrate Halloween with JOLLY TIME! If your family celebrates Halloween, you have probably been in planning mode these past few weeks. What costumes to wear, where you’ll take the kids Trick or Treating, or you may even be throwing a party. The Halloween party is the highlight of all the parties I throw each year. I spend weeks organizing the games, prizes, and most importantly, the food! For me, popcorn has always been a staple in our Halloween festivities, and I make sure I serve JOLLY TIME Popcorn to all my ghost and goblin guests! It’s definitely a healthier alternative to all the candy the kids will be receiving, and JOLLY TIME is a guilt-free, gluten-free, high fiber snack. It is also GMO-free, and is the only popcorn that has been endorsed by Weight Watchers. In honor of October being National Popcorn Month, today I will be sharing a few of my favorite party popcorn treat recipes with you. While my versions may not be endorsed by Weight Watchers, the children that come to my party will vouch that these are some tasty popcorn treats! In a large bowl, combine the popcorn, peanuts, and candies. In a large saucepan, combine marshmallows and butter. Cook and stir over medium-low heat until melted. Add to popcorn mixture. Mix well. When cooled enough to handle, shape into 2 inch popcorn balls. Let stand until firm. Wrap in plastic wrap until ready to serve. candy mix ins, such as orange and black sprinkles, orange and black mini chips, gummy worms, ect. Spread popped corn onto a baking sheet lined with wax paper. Melt candy melts according to package directions. Pour melted candy over popcorn. Immediately mix in marshmallows and your candy mix ins of choice. JOLLY TIME also offers some other fantastic Halloween recipes right on their website. You'll find a variety of recipes, but I think these Caramel Corn Apples look divine! When my girls come home after a long night of candy hunting, I always smile at how excited they get when they find popcorn in their bags. JOLLY TIME’s 100 calorie mini bags make a perfect alternative to passing out candy to the Trick or Treaters! Not only is JOLLY TIME the perfect holiday treat, it’s also a great snack for us big kids too! One of my new favorite varities of their popcorn is the JOLLY TIME Butter made with the Smart Balance blend of oils. It really is Oh, YUM! You can purchase JOLLY TIME at most major retailers near you. *Disclosure- I received samples of the above mentioned product courtesy of the sponsor for the purpose of this review. No monetary compensation was provided. All opinions are my own, based on my experience with the product, and have not been influenced by promotional items. That monster mix is PERFECT for the Halloween party that my boys are going to later this month!! I am totally going to add in the gummy worms, too! My Hubs loves the Jolly time. I don't eat popcorn much but I did have one bite... tasted pretty good. Those look great! I'm going to have to try making these this year. I have been seeing them everywhere and they are just tempting me! lol Thanks for sharing! These look delicious to me. I love popcorn treats. I love Jolly time popcorn! 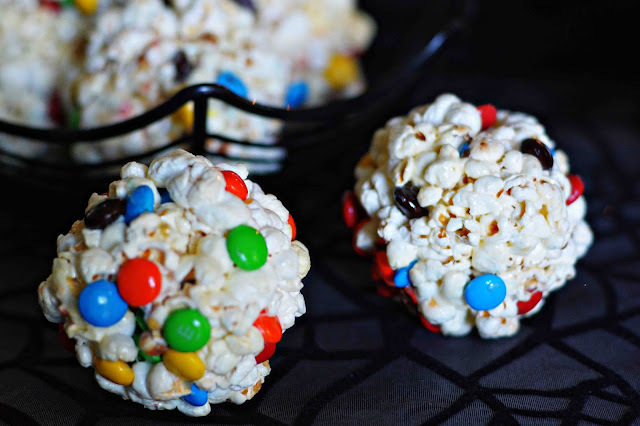 And those popcorn balls look absolutely amazing! That Monster Mix looks delicious. I love the combo of sweet and salty flavors. Now that monster mix looks delicious! I'm going to make it for my daughter! Very rich cake, good decor, nice colors Colors! The popcorn covered apples are such a great idea! I need to find Jolly popcorn at the store! I like peanuts in anything! these look great! really want to try that monster mix! I think you have given me an idea-instead of buying candy which I end up eating if not enough kids show up--I will buy the ind Jolly time and hand those out!! That monster mix looks good! I also love popcorn. I'm assuming that you don't hand out the already popped corn to the trick or treaters. Great idea for a party though, that mix recipe looks awesome. I want some now! So yummy! This would be perfect for our Halloween party this year for the little ones. I love Jolly Time popcorn. It is one of the best. I love these treats for Halloween too! I am definitely going to make some yummy's this year!! Pinned your recipe! Thanks for sharing Theresa! 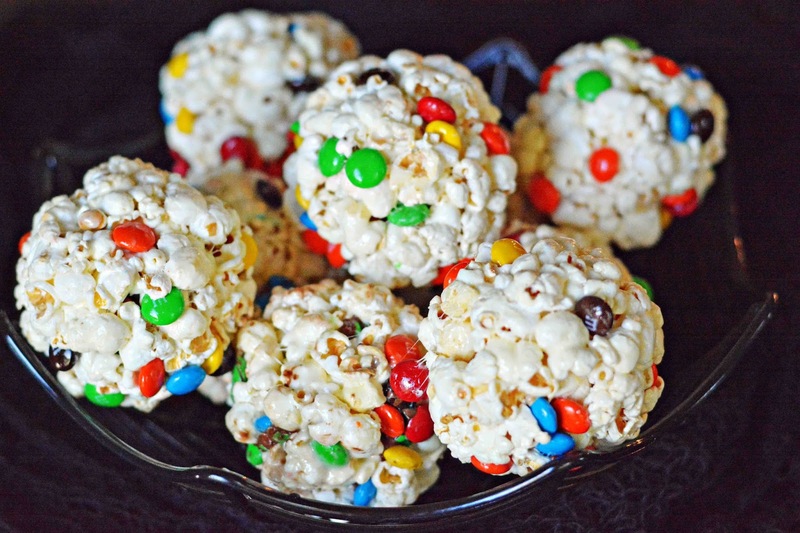 I am now seriously craving one of these popcorn balls!! Looks like JOLLY TIME Popcorn is a Halloween hit this year, it would be great for parties and movie nights. Love your Halloween popcorn balls. that looks so good :D seriously need to do something awesome this year. my son would love this for himself. in our apartment building no one comes around to hunt candy so... i'd mainly be doing it for like.. family. I could totally eat handfuls of that Monster Mix right now! That looks so tasty! I'll have to give it a try. (Celebrate Halloween with JOLLY TIME!) What a good recipe to make for us on Halloween night, will be a hit with the whole family for sure.